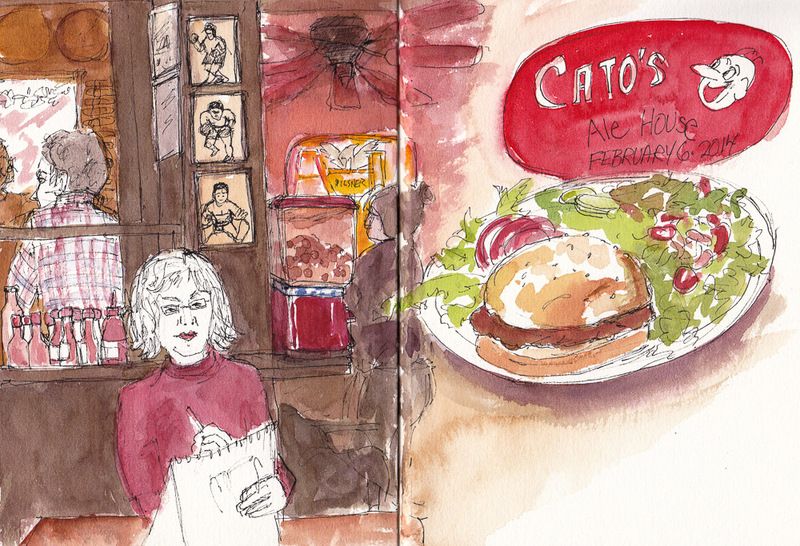 When we planned the Urban Sketching evening for Cato’s, a great old pub, little did we know that a large group of Kaiser doctors were also planning a happy hour event that night too. The place was totally packed but a large group of urban sketchers made it work anyway. We gathered around several tables and sketched eaters, drinkers and sketchers (and in my case, dinner). My hamburger was delicious but I ate it too quickly, anxious to get sketching and a bit overwhelmed by the noise and crowds. That was my first night out sketching since adopting my pup, who was waiting patiently and not all that happily in her bed in my car in the parking lot of the PetFood Express store across the street from the pub. Lovely sketch regardless of your hurry.